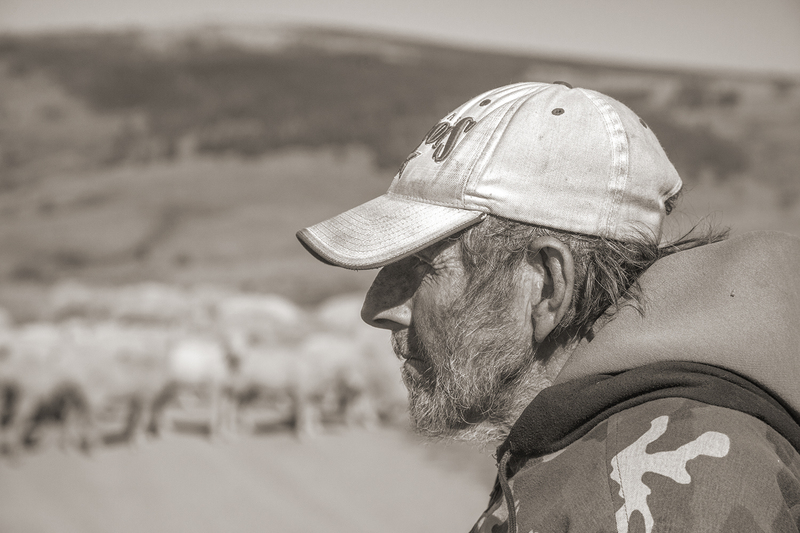 I spent Friday morning with the nearly famous sheep herder, Victor “Cuba” Hernandez and his patron, Andrew Abeyta. 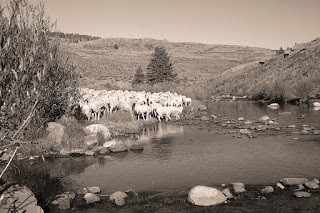 I awoke at 4:15, sacrificed my morning shave and arrived in Mogote about 15 minutes early for the trek to the place where Cuba and the sheep would cross the Rio de Los Pinos just south of Osier, Colorado. Cuba had left his last camp in the high country at about 7am and would trail the sheep back to the Abeyta ranch in Mogote by day’s end. 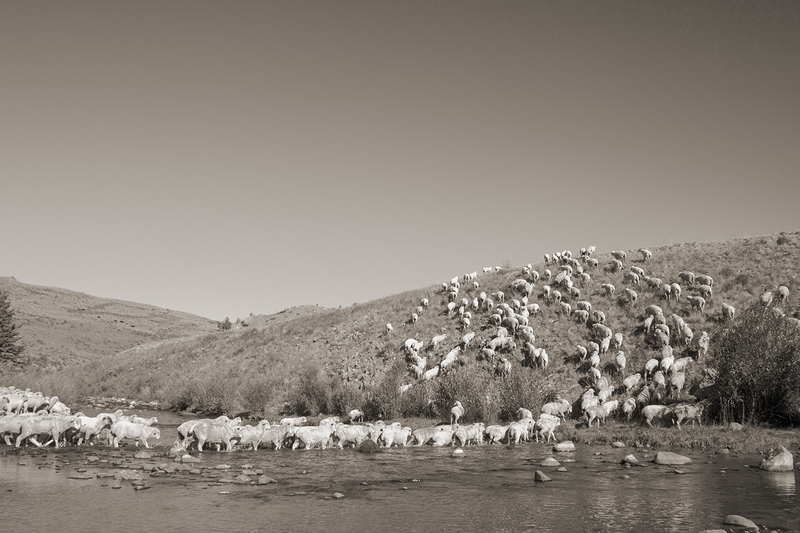 I bailed about noon having photographed the crossing and just enough sheep butts to have had my fill. 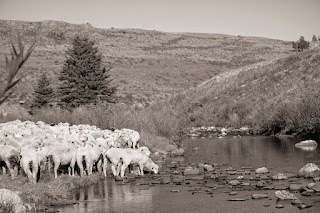 Naturally I’m delighted with the news since Cuba has been the constant in the story and is the embodiment of the sheep herding cycle in the San Luis Valley. Besides I didn’t get to his high camp in Cruces Basin and now will have another shot next year. 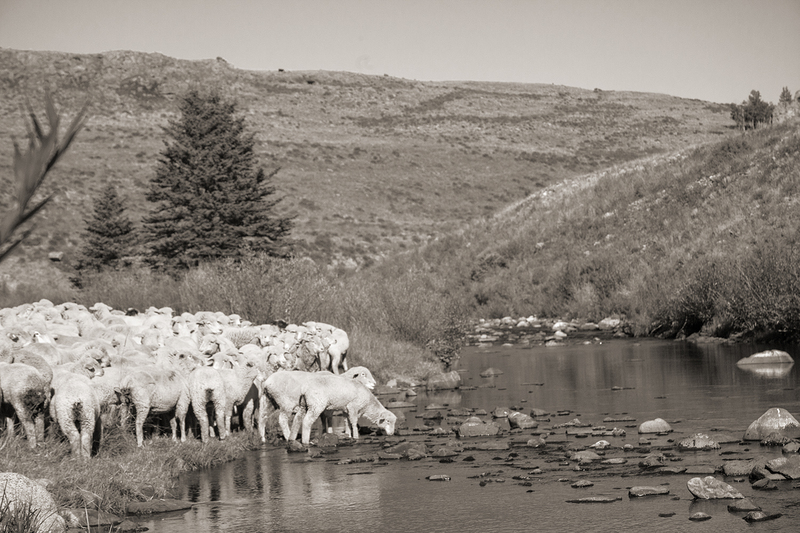 Sipping coffee and leaning on his pick-up Andrew explained that once the sheep arrived at the river there was no telling when they would cross. They might just hang out and graze for half an hour and decide it’s time. And that's precisely the way it happened..
As Andrew and I chatted while we waited for Cuba I asked some questions that would help me chronicle his family’s history as sheep ranchers and, more importantly, to understand the deep attachment that they have to the land and the life they have pursued since that first orphan lamb nearly a century ago. While I have a better handle on the chronology of their story I'm still a country mile from understanding why their tie to the land and the ranching life is so strong. Strong, in fact, doesn’t come close to describing the depth of Los Abeytas' roots in the life of land, water, family and faith. It seems to be unbreakable and forever. As usual, a fascinating narrative supported by extraordinary photography. Always a treat to open up another post to Steve Immel's blog! Jim is spot on with his comments. 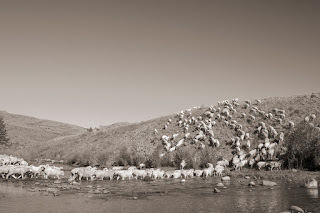 I was amazed to see the sheep actually crossing el rio, wondering how much cajoling that took. That photograph and the first photograph of Cuba sandwiching the many heads and butts were a perfect complement to your text, Steve. Fingers crossed there is a book in the making.